There are a few deals left in the market nowadays, and The Greenbrier Companies, Delta Air Lines, and Alliance Resource Partners are among them. It's funny how the valuation for stocks perceived to be "on sale" seems to creep up as the broader market ticks up. There are lots of stocks that look cheap compared to the S&P 500 today, but that isn't too hard when its aggregate price-to-earnings ratio is creeping toward 26. If you want to find real value in a stock on sale that is actually worth adding to your portfolio, you have to really dig. That said, stocks on sale still exist in this market. Three companies that look to be both cheap stocks and worthwhile investments are rail car manufacturer The Greenbrier Companies (NYSE:GBX), Delta Air Lines (NYSE:DAL), and coal producer Alliance Resource Partners (NASDAQ:ARLP). Here's a quick look at why these stocks are cheap and why you might want to put them on your investment radar. It's sometimes amazing how long it can take for the market to get wise to the fact that a company isn't what it once was. In the case of rail car manufacturer Greenbrier, it seems that they are missing out on a well-run business that isn't the debt-laden company it once was. Looking at Greenbrier three to five years ago would have seemed a bit crazy, as the company's debt load was looking to be out of control, and its returns on investment weren't exactly inspiring enough to overlook its balance sheet bloat. 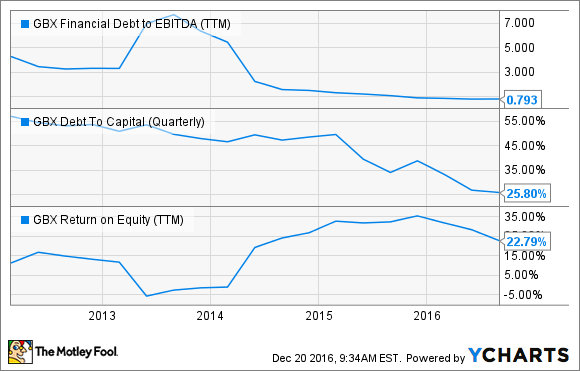 GBX Financial Debt to EBITDA (TTM) data by YCharts. During that time, management was looking to revamp its manufacturing base by focusing on efficient operations, creating a more diverse offering of rail cars that fit almost all rail transport needs, building out a fleet of leased rail cars, and providing rail car maintenance services. The combination of all these things has paid off, as EBITDA margin has more than doubled over the past five years to 17% today and it has more than a year's worth of revenue in its backlog of work. Despite these operational improvements and management chipping away at that debt load, shares of Greenbrier still trade at a very cheap enterprise-value-to-EBITDA ratio of 3.2 and a P/E ratio of just 7.5. It would seem that Wall Street has not become wise to the transformation Greenbrier has undergone in recent years, and it's an opportunity to buy this company on the cheap. To go from one of Warren Buffett's poster children of a horrible industry to becoming a holding in Berkshire Hathaway, you have to have done something right. This past quarter, Berkshire announced that it had taken a stake in Delta Airlines (along with several other airline companies). That may come as a surprise, but when you start to look at the numbers, you see why this is more fitting of a Buffett investment than it once was. One of Buffett's biggest beefs with airlines over the years was the fact that they were growing fast. To grow fast in this industry, though, it takes immense amount of capital spending. That isn't a recipe for generating free cash flow and has in many cases led to numerous bankruptcies over the years as debt-fueled growth bit back when flying demand waned. Today, though, a more consolidated industry and the major airlines taking a much more prudent approach to capacity growth has transformed these companies into strong free-cash-flow-generating machines. 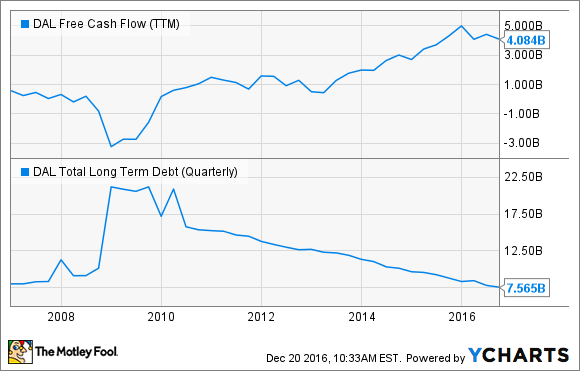 Delta in particular has been a strong free cash flow producer in recent years, which has also helped get its debt load under control. DAL Free Cash Flow (TTM) data by YCharts. Even though shares of Delta have gained 33% over the past six months, the company's stock still looks relatively cheap with an enterprise-value-to-EBITDA ratio of 5.1 and a P/E ratio of 8.2. Based on Delta's recent investor day presentation, we may be headed for a slight slip in profitability in the coming years, but the industry's better focus on returns could mean a quick response to the situation versus the previous boom-and-bust cycle. If Delta can convince Berkshire that it is a worth investment after years of being a punching bag for Buffett, then investors should at least take a look. Those bullish on coal have been saying that an uptick in prices is less than six months away...for more than three years now. The big issue with coal is it takes immense amounts of capital to keep production steady, but the emergence of shale gas in the U.S. has given electric power providers a cheaper alternative that has been taking market share and keeping the coal market in a perpetual state of oversupply. This, coupled with many poor management decisions, led to the nation's three largest coal producers all declaring bankruptcy in the past couple of years. Image source: Alliance Resource Partners corporate website. With all of this bad news surrounding the industry, it's pretty easy to see why Wall Street doesn't have a lot of faith in Alliance Resource Partners. Today, units trade at an incredibly cheap enterprise-value-to-EBITDA ratio of 3.3 while boasting a 7% distribution yield. If Alliance was like the rest of the industry, this would be merited -- but it isn't. There are two key things that separate Alliance from the rest of the industry: Geography and a conservative management team. Alliance's production comes mostly from the Central/Illinois Basin region. This relatively new coal production region has much cheaper operations than places like the Powder River Basin and Appalachia. In these other regions, most of the prolific coal seams have been exploited. That's why over the next couple of decades, coal production from the Illinois Basin is expected to remain rather steady while the others bear the brunt of lower coal production. Then, there is the fact that Alliance's management has done a much better job of being prudent with its balance sheet and payout to shareholders. Instead of going for big growth gains with acquisitions, it has looked for modest gains from increased capacity at its existing mines. Also, management was much quicker to cut its payout at the first signs of trouble rather than putting financial strain on the business. As a result, Alliance generates plenty of cash to keep its business humming along and still reward investors with a generous payout. Coal may be in its twilight days, but investors in Alliance will catch the last rays of light this business has to offer.